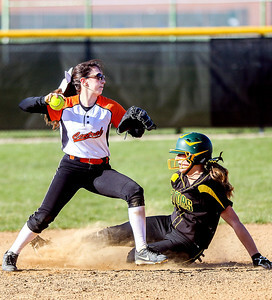 Sarah Nader- snader@shawmedia.com Crystal Lake Central's Kelly Iwamoto (left) waits for the ball while Crystal Lake South's Brittany Baker safely sides to second during the second inning of Monday's game at Crystal Lake Central High School April 11, 2016. Central defeated South, 6-5. 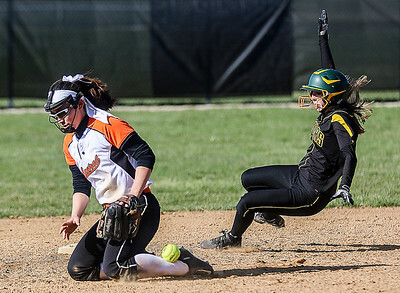 Sarah Nader- snader@shawmedia.com Crystal Lake Central's Kayla Duda (left) throw to first while Crystal Lake South's Samantha Schettl is out as she slides to second during the third inning of Monday's game at Crystal Lake Central High School April 11, 2016. Central defeated South, 6-5. 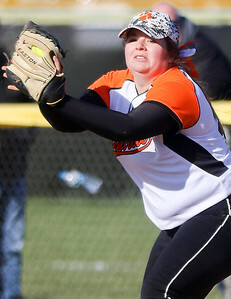 Sarah Nader- snader@shawmedia.com Crystal Lake Central's Savanah Frank catches a pass at first during the third inning of Monday's game against Crystal Lake South April 11, 2016. Central defeated South, 6-5. 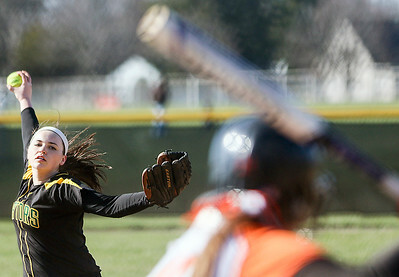 Sarah Nader- snader@shawmedia.com Crystal Lake South's Chloe Skorija pitches during Monday's game against Crystal Lake Central April 11, 2016. Central defeated South, 6-5. 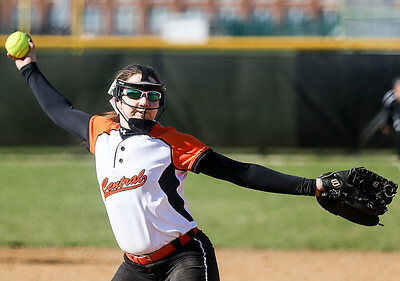 Sarah Nader- snader@shawmedia.com Crystal Lake Central's Amy Walsh pitches during Monday's game against Crystal Lake South April 11, 2016. Central defeated South, 6-5. Sarah Nader- snader@shawmedia.com Crystal Lake South's Samantha Schettl fields a ball during the third inning of Monday's game against Crystal Lake Central April 11, 2016. Central defeated South, 6-5. 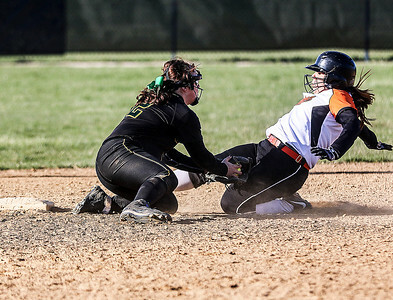 Sarah Nader- snader@shawmedia.com Crystal Lake South's Taylor Kassel tags out Crystal Lake Central's Alexandria Ramos while she slides to second during the fourth quarter of Monday's game at Crystal Lake Central High School April 11, 2016. Central defeated South, 6-5. 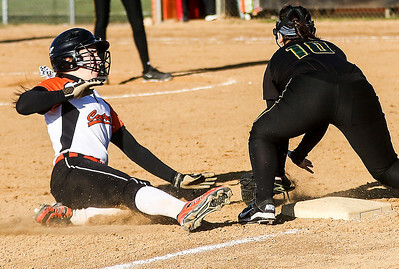 Sarah Nader- snader@shawmedia.com Crystal Lake Central's Amy Walsh (left) safely slides the third while Crystal Lake South's Cailey Giuffre waits for the ball during the fourth inning of Monday's game at Crystal Lake Central High School April 11, 2016. Central defeated South, 6-5. 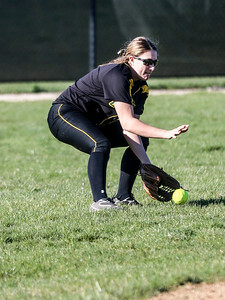 Crystal Lake South's Samantha Schettl fields a ball during the third inning of Monday's game against Crystal Lake Central April 11, 2016. Central defeated South, 6-5.